Mission:The Kentucky Horse Council is a 501(c)3 nonprofit organization dedicated, through education and leadership, to the protection and development of the Kentucky equine community. The Kentucky Horse Council is the official affiliate of the American Horse Council, located in Washington, DC, a national organization representing all segments of the horse industry. Any resident of Kentucky can be a member of the Kentucky Horse Council. In addition, horse clubs and horse-related businesses can also join and take advantage of membership benefits which support club growth and activities, and support the health and vitality of our horse businesses. How is the Kentucky Horse Council funded? 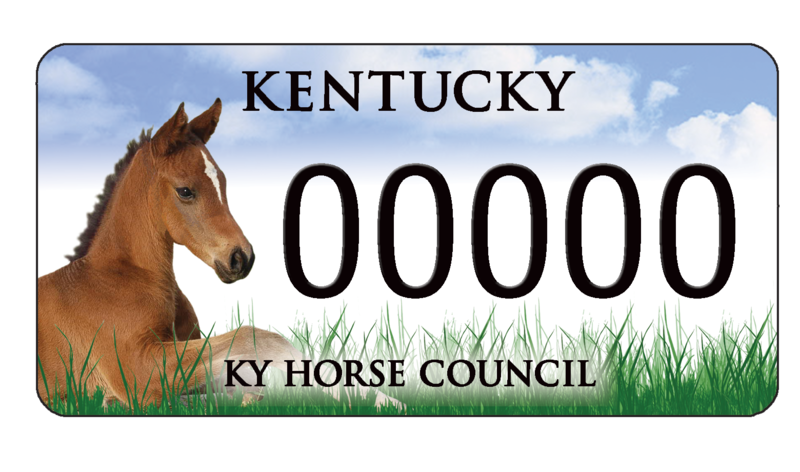 The Kentucky Horse Council's operating funds come primarily from the specialty license plate featuring the foal lying in the grass. Each time a resident purchases a plate, the Horse Council is allocated a payment fee. The Kentucky Horse Council license plate is the ONLY specialty plate which can be purchased for both individual and farm vehicles. In addition, the Kentucky Horse Council pursues additional sources of funds, working with equine industry partners, which we put right back into statewide horse programs. How does the Kentucky Horse Council use its funds? Educational Seminars: Education is a major part of the Horse Council mission. As such, we provide financial support for seminars and conferences which feature experts on topics including trail building, nutrition, large animal rescue, horse show management, and others. ENews: Our weekly Kentucky Horse News is popular with hundreds of horsemen in Kentucky. It provides news and announcements both within the state and nationally which keep our horsemen up to date on events, federal legislation, racing news, unwanted horse issues, and more. Horse Industry Conferences: The Horse Council is a sponsor of the KEEP Equine Industry Conference, which brings together professionals from many facets of the equine industry in Kentucky. Horse Association Support: Many horse associations in Kentucky have joined the Kentucky Horse Council as an association member, which provides them priority attention from the Horse Council, and also allows all of their members to be complementary members of the Horse Council, receiving all benefits of a paid membership. Humanitarian Aid to Horses: the Kentucky Horse Council has several health & welfare programs to assist at-risk horses. Our programs educate law enforcement and animal control officers how to investigate equine neglect. Through the SoHo fund KHC also provides feed and care for confiscated horses when they are seized by the county. In addition the US Disaster Relief Fund helps with hay shipments to horses affected by natural disasters like Hurricane Katrina, Hurricane Ike, flooding, and more. We also have strong support for horse rescue operations and the unwanted horse issues. Legislative Efforts: Our legislative efforts involve taking publicized positions and distributing advocacy statements to Kentucky's state legislators. KHC also began hosting a Legislator's Reception in 2012. Agricultural Industry Presence: The Kentucky Horse Council participates actively in the Kentucky Agriculture Council and the Equine Committee of Kentucky Farm Bureau. KHC also has good relationships with the KY Department of Agriculture and the State Vet's Office. How is the Kentucky Horse Council organized? The Horse Council is governed by a Board of Directors, consisting of 12 to 23 representatives from all aspects of the horse industry. The board meets bi-monthly. In addition, there is a staff consisting of an Executive Director and Operations Manager. Several active committees such as marketing/membership, health and welfare, and recreational rider shape the direction of programs. Committees are open to all active members of the Horse Council.